The new year is always such a great time of year to start fresh! Whether you’re making more intentional plans for a little “self care” or you’re just wanting to try something new in 2019, we can help! We’ve put together all of our favorite hair trends of 2019 that we know you’re going to LOVE. If you see a look you’d like to try, book your reservation online or call the salon - 864.220.4979! Our guest experience team would be happy to help you schedule the right appointment with the right stylist to achieve your new look! Now onto the new looks for the new year! We’ve all been watching trends from the 90’s make their way back around recently (hello platform tennis shoes 😉). The 90’s bob hair trend is also making a comeback. Wear it sleek and center parted, or more curled under for retro vibe (is 90’s already retro?!). Either way, we love the sophistication and simplicity of this almost timeless hairstyle. No…that’s not a misspelling. 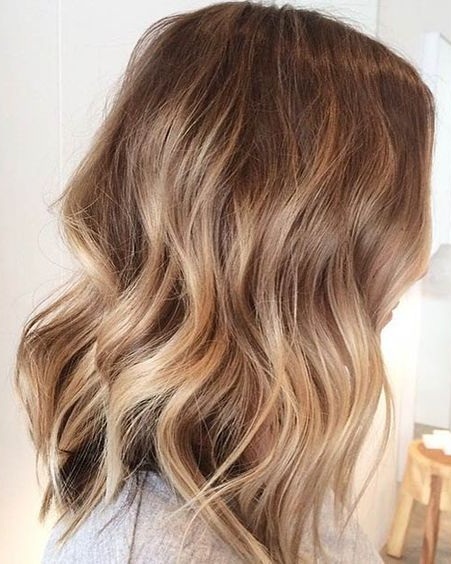 It’s Brown + Blonde - aka one of the PRETTIEST color trends of 2019. This color trend is so natural and is best achieved through balayage or high/low lights. Your stylist can help you determine whether a more golden or cool tone is best for you, but this hair color is flattering on almost everyone! This hairstyle is the easiest hairstyle EVER. You can wear it straight, curled, air-dried or up and it’s stylish no matter what. The longer layers up front elongate (aka slim) your face while the shorter back layers give plenty of volume. We love this look best when you add on some face framing balayage or highlights to really enhance the glow around your face. This method of highlighting is the most natural looking hair color you can get. Stylists take tiny strands of hair in foils to get an all over, naturally sun kissed look. But this hair color trend isn’t just for blondes. Brunettes are loving the natural way it can add some glow to their locks, too! Maybe it’s the influence Disney princesses have had on us from an early age, but we just love long hairstyles. 2019 has plenty of layered hairstyles that are so beautiful and feminine. We love it when this hair is styled with big loose curls (very 70’s glam) or with a big round brush.